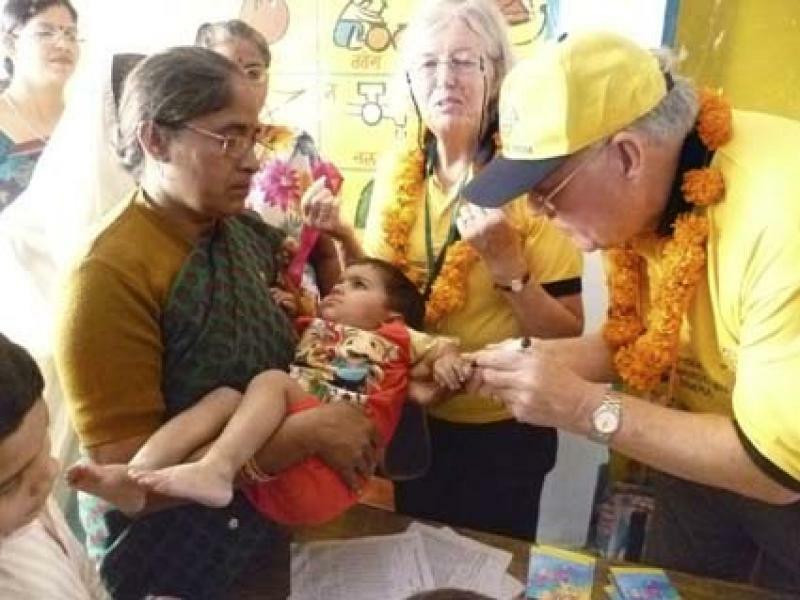 In November 2010 Jenny Owen and Alan and Janey Sonnex from the Rotary Club of Jordans and District, joined a group of 20 Rotarians from across the UK to take part in India's National Immunisation Day, when millions of 0-5 year olds are vaccinated against polio. We arrived in Delhi on Friday 11th, warmly welcomed by the Rotary Club of Delhi South West. Early next day 14 of us (the others remaining in Delhi) left by coach for Bareilly, five hours eastward, the journey a fascinating panorama of the colour and bustle that is India. 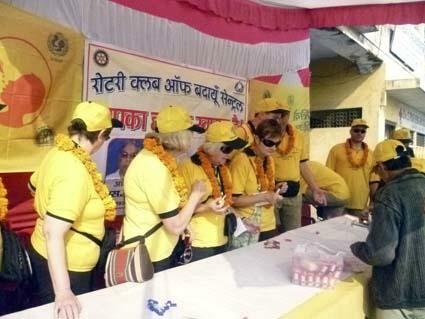 Our friendly hosts were the members of Bareilly South club, who first divided us into small groups to view club projects: we were shown a mobile dental clinic that serves poor families for a token charge. They have plans to add an eye-testing facility too. We then dined in a Rotary-owned building that includes an impressive limb clinic run entirely by the members who include two orthopaedic surgeons! On Sunday the real purpose of our visit began. 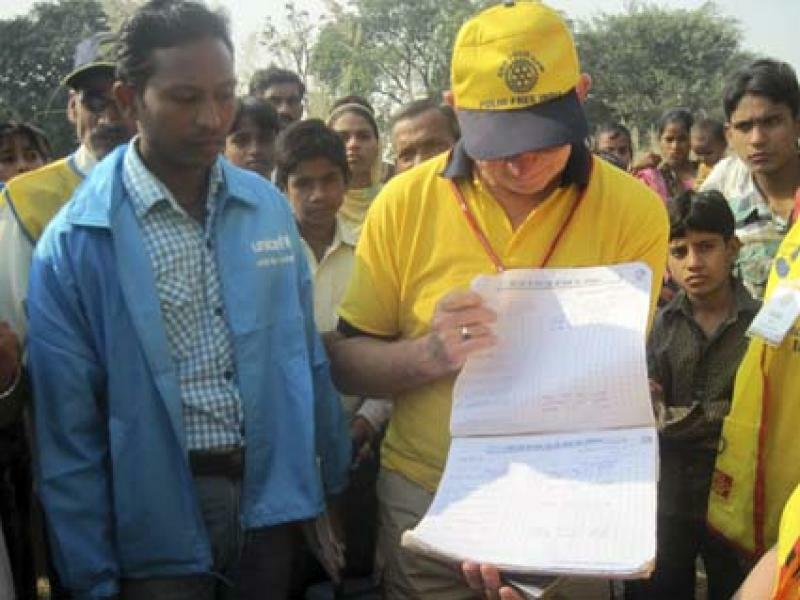 We were taken to Badaun, a small town in a vulnerable area, instructed and tested in the technique of giving vaccine (two drops on the tongue) then split into groups of 3 or 4, each accompanied by a local Rotarian and two Health Workers, and taken to rural villages where the polio booths had already been set up. At the first village, we met an excited throng of parents, children, teenagers and elders. As westerners far from tourist routes, we attracted much curiosity. The booth (table and chairs) was located in the village school, and immediately a lively queue formed.. The Health workers unsealed the vaccine, and we took turns one giving the drops, one painting the child's finger (the purple pinkie) and the third presenting a small gift e.g. magic slate. We had occasional help from a Health Worker to persuade a reluctant toddler! Having given some 182 doses, we moved on to a larger village, where the process was repeated in two more booths. Walking between them, with a large entourage of followers, reminded us of the Pied Piper! Here we immunised 205 more. The experience was hugely rewarding and we were delighted to learn that some 50% more children had been treated than previously when no overseas Rotarians were present. Strangers bearing gifts can make a difference! On the following day the clear-up took place. The whole group were taken to Angthara, where we accompanied Health Workers and a UNICEF representative, on a methodical and carefully recorded visit to homes where children had missed their vaccination. Again, we experienced a fascinating insight into village life. 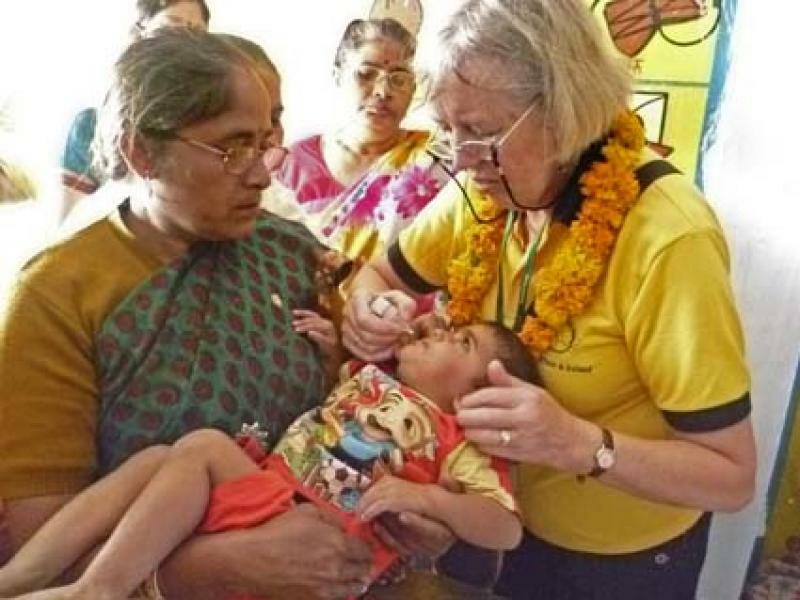 There has been only one reported case of Polio in India this year. Hopefully, in two more years the country will be designated clear, and Rotary's mission there will be fulfilled. It was a real privilege to be a small part of that mission.